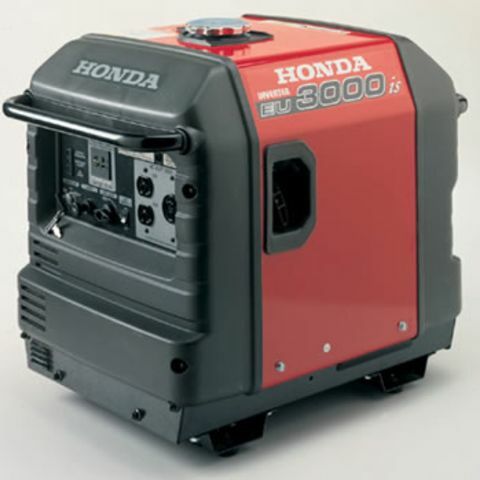 Honda's quiet and clean entrant in the 3KW category of generator rentals runs quiet and clean, for demands of home appliances, or RV AC units. This Honda model does this task extremely efficiently, with a 3.4 gallon tank fueling the unit for up to 20 hours of run time. Generator rentals at the 3KW category run quiet and clean, providing enough to power support home appliances, or power RV AC units. This Honda model does this task extremely efficiently, with a 3.4 gallon tank fueling the unit for up to 20 hours of run time. Because this generator rental unit has an inverter, it produces power that's clean enough to support sensitive tech equipment like computers.